Die Europäische Bürgerinitiative ist ein von vielen bisher kaum bemerktes Element des Vertrags von Lissabon. Doch diese vielfach als Placebo kritisierte Form der Scheinmitwirkung könnte die Europäische Union rasch verändern. In ihr liegt der Keim für eine europäische Öffentlichkeit und europäische Parteien. Schon allein das ist ein Erfolg der Initiative. The European Citizens' Initiative is a feature of the Treaty of Lisbon that many people have as yet to discover. 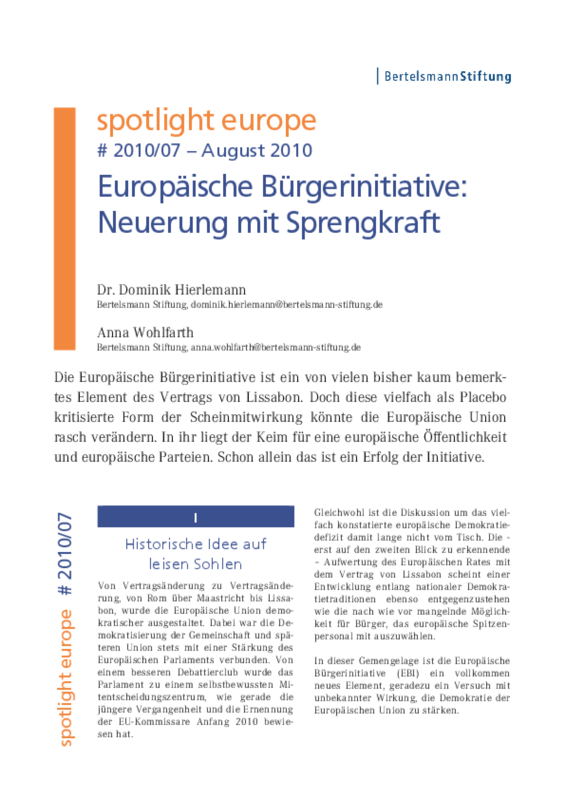 However, even though it has often been criticized as being a kind of bogus participation that is no more than a placebo, it may well change the European Union, for it contains the seeds of a European public sphere and European parties. In this respect the initiative has already been a success.